This dessert always reminds me of a trip we took to Puerto Rico a few years back. We spent time on the main island, which was beautiful, but hectic and then went to a tiny island for the last few days. It turned out to be our favorite part of the trip. It was everything you always picture the Caribbean to be-gorgeous blue water, sandy beaches and slow days. I love flan and had expected to be able to eat my fill on this trip since I know it’s popular in Puerto Rico, but for some reason, we had trouble finding it in the restaurants we went to. On this island, the restaurants were serving Italian cuisine, so no flan was to be found. Then, on our next to last day, I asked about flan and someone told us that a woman on the island made the best flan and we had only to walk to her house to get some. We started off in the heat of the day and soon found one hand made sign that said “coconut flan for sale” with an arrow pointing up the road. We walked and walked and found no more signs. We asked for directions and kept getting smiles and directions that took us one way and then another, but no flan was to be found. My family was ready to give up, but I wasn’t. We walked back where we had started and tried again. As tenacious as I was about finding that flan, we never did find the right house. I know you were hoping for a better ending, so was I, but it was a lesson in reality. Sometimes, the flan just can’t be found so you have to learn to make your own. It’s not ever going to be as good as eating it sitting by the Caribbean, but it’ll do. Put the 1/2 cup sugar and 1 tbsp rum in the pan you’ll be cooking the flan in. Place over the burner and put on medium-high heat. Shake the pan and watch constantly while sugar melts. When the sugar begins to bubble and is mostly liquid, remove from heat and tip pan so the caramel glaze covers the bottom of the pan evenly. This usually takes me 5-10 minutes at most and I use tongs to shake and tip the pan to be sure the sugar doesn’t scorch. Set aside and make custard. Preheat oven to 350 degrees and find a pan that’s larger than the one you’re making the flan in. You’ll need to place the pan into a larger pan and fill with 1/2 to 1 inch of boiling water so that the water comes about half way up the side of the flan pan. I usually put water on to boil now as I’m making the custard. Put the eggs into a large bowl and lightly beat. Then add remaining ingredients and whisk together until well blended. Pour the mixture through a strainer into the prepared pan. Place the pan into the larger pan and place in oven. Pour hot water into the larger pan until it comes about halfway up the side of the pan. 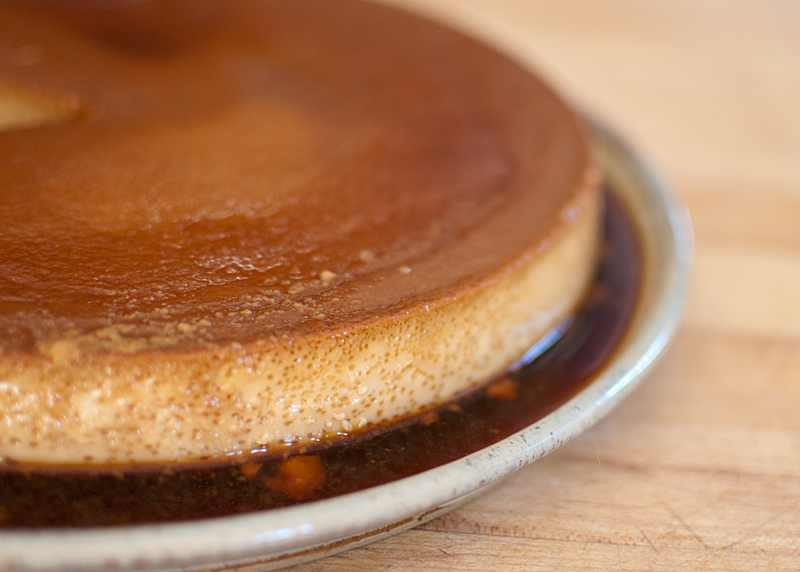 Bake 45-50 minutes or until a toothpick or knife inserted into the center of the flan comes out clean. It will still be jiggly, but if the knife comes out clean, it’s done. Remove from the oven and the hot water and put on a rack to cool. When ready to unmold, run a knife along the side of the flan, put a large plate over the top and flip. The flan should fall out onto the plate and the caramel will run over the sides. If it doesn’t unmold easily, put bottom of pan in warm water and try again. This entry was posted in desserts and tagged coconut milk, flan.